FACT: MILSATCOM saves lives. Such requires constant work. No sooner is one technology implemented than another requires testing and consideration and then implementation. Certainly a never-ending process, but one thats crucial to those who are laying their lives on the line to ensure the safety of a nations citizens. 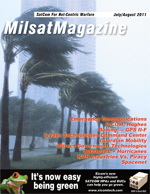 In this info-packed issue, we present a variety of topics to assist with this process that should be of interest to NGOs, government agencies, first responders and our military muscle to consider as routes to more secure, more reliable, and more effective communications. COMMAND CENTER: David Hershberg, Founder and CEO, Globecomm Systems, Inc. In 1959, ITT Defense Communications was working on Earth stations for the first active SATCOM carrier as well as for many of the early satellite programs. And David Hershberg started his career by working for this company and then, in 1968, he founded ITT Space Communications, Inc. In 1972, David founded Comtech, Inc., Systems Division, and Satellite Transmission Systems, Inc., in 1976  a wealth of experience, to be certain. COMM-OPS: UAV Cellular Payload for First Responder Emergency Teams, by Robert Varga, Ph.D.
As National Guard, fire, police and other military and civil first responders begin to stabilize a region in the wake of a natural or manmade disaster, they face challenges in coordinating their efforts using standard UHF or VHF radio communications. Reacting to these challenges during the 2007 wildfires in southern California, enterprising first responder groups successfully used their personal cell phones to improve communications interoperability. Flashpoints around the globe continue to drive demand for commercial satellite capacity despite the availability and launch of military satellite bandwidth. The first Wideband Global Satcom (WGS) launched in 2007 and the second in early 2009 provide the U.S. Department of Defense (DoD) with much needed internal capacity in its goal to attain self sufficiency or at least achieve its aim of relying less on commercial capacity in its current operations as well as for future missions. More WGS satellites are on the way as well as other U.S. DoD programs including the AEHF and MUOS, which should provide even greater capabilities for enabling the warfighter for future bandwidth-hungry and critical applications. CASE WORK-NASA, This article is courtesy of SCIENCE@NASA and Duana D. Coulter. On Thursday, May 28th, 2009, at 2:24 a.m. local time, a deadly earthquake rocked Honduras, killing seven people and injuring several others, demolishing homes, damaging scores of other buildings, and sending terrified residents running through the streets. Location of military equipment in the field is an essential requirement for the warfighter. In The Brick Moon, a book published in 1873, E.E. Hale, the author, described four 600m diameter satellites which were in polar orbits of about 6500 km altitude. Two of the satellites passed regularly over Greenwich in the United Kingdom, while the other passed regularly over New Orleans, USA. The purpose of these satellites, which were apparently manned, was to be used by navigators to determine longitude.